'When I am afraid, I put my trust in you. 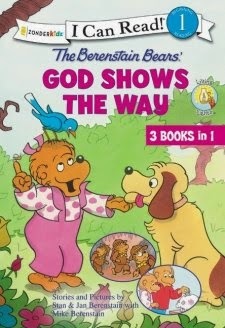 In Faith Gets Us Through, the Bear Scouts go on a hike with Papa to explore a spooky cave. They are afraid, but they pray and keep strong in their faith as they adventure through some surprises along the way. Sister Bear must confront her fears in Do Not Fear, God is Here. Though she has outgrown most of her fears, there is one that she hasn't been able to overcome. She must learn to trust God to help her and trust that He is watching over her when she is in situations that make her afraid. Piggy Bank Blessings shows the cubs learning about money as Mama explains that they "cannot have all the things." They learn to work to earn money and save some of it. They must also learn to spend wisely, and readers are in for a sweet surprise.